The north wall of the burial chamber depicts three separate scenes. On the right, Ay, Tutankhamen's successor, performs the 'Opening of the Mouth ceremony on Tutankhamen, who is depicted as Osiris, lord of the underworld. In the middle scene, Tutankhamen, dressed in the costume of the living king, is welcomed into the realm of the gods by the goddess Nut. On the left, Tutankhamen, followed by his ka (spirit double), is embraced by Osiris. The famous burial mask of King Tutankhamun on display at the Egyptian Museum in Cairo, Egypt. The 24 pound (11 kilogram) mask is made of gold, glass, and precious stones. The nemes headdress features a vulture, symbolizing sovereignty over Upper Egypt, and a cobra, symbolizing sovereignty over Lower Egypt. Again, like in many cases in history, beginning from 1922, Tutankhamun is in the center of world’s attention. After all the research that has been made about him, besides all the physical evidence that exist, we still know very little about this 3,330 -year-old pharaoh. Several weeks ago, a new discovery has been announced that may reveal even a deeper secret surrounding Tutankhamun and “KV62”, the tomb which is his resting place. After Two days of thorough radar scanning Mamdouh El-damaty, Egyptian antiquities minister has announced that archeologists have found more evidence that there are hidden chambers inside Tutankhamun’s tomb. 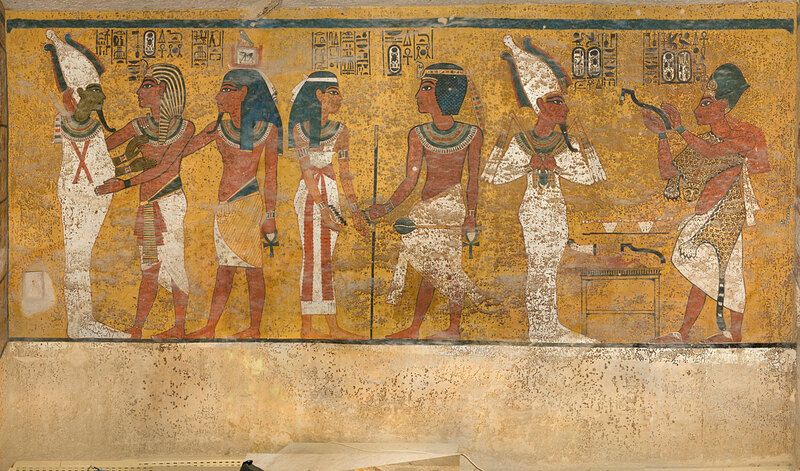 The scans are revealing a new, undisturbed part of the tomb. It is believed that there is an unopened corridor behind the North wall of the tomb, which could lead to another chamber that sits untouched for a very long time. The scans were conducted by Hirokatsu Watanabe, a Japanese radar specialist. He also provided evidence that there is another hidden doorway in the west wall of the tomb. This discovery did not happen suddenly. Nicholas Reeves, the lead archeologist behind this project, has had the idea of hidden chambers inside the tomb for many years. But, in 2009 he got his first visual evidence that something really exists behind the walls. Back in 2009 Madrid-based team of conservators and artists called Factum Arte were making high-resolution laser scans of the tomb. Their idea was to create a precise digital replica which people can observe without damaging the original location. Their scans clearly showed the texture of the walls in black and white without the presence of the ancient paintings. After looking at the images with the bare walls, Reeves noticed that there is a series of perfectly straight vertical lines and their shape closely reminded of partition walls and doorways. This encouraged him to investigate further and bring his research to the point at which it is today. Watanabe needed to modify his radar equipment for the task of scanning this lines. Usually, these kinds of radars are turned downwards for scanning the ground. He needed to scan sideways so he adapted his “Koden” radar machine for this purpose, by placing the body and radar antenna vertically, on a small trolley cart. This amazing discovery can only confirm the controversial theory of Nicholas Reeves, that has been anathematised by mainstream history for a long time. Reeves claims that the tomb of is just a rushed outer chamber which is part of a much bigger complex. The tomb of Queen Nefertiti, Tutankhamun mother-in-law. Some experts believe that she was also one of Egypt’s pharaohs. Nicolas Reeves stated the following for National Geographic: “Everything is adding up. The tomb is not giving up its secrets easily, but it is giving them up, bit by bit. It’s another result. And nothing is contradicting the basic direction of the theory” (referring to his theory). When I first published my paper I think that colleagues around the world thought I was crazy, but I think it has changed. I think people believe that even if the tomb of Nefertiti isn’t behind the wall, they believe that something else is there. Even after this deep scientific examination of the walls of the tomb, and even after Egypt’s antiquities officials said that they are 90% sure that there is something undiscovered laying behind the walls, archeologists are still not convinced about this theory. They still demand more research. One thing is certain, everybody is eagerly awaiting the final result of this project. Mamdouh el-damaty said that the search will continue after one month when the scan results are back from Japan. It is highly possible that a small camera will be put inside the hidden corridor in Early 2016 after a small hole is drilled in one of the walls. It will e truly spectacular to see what is really inside.